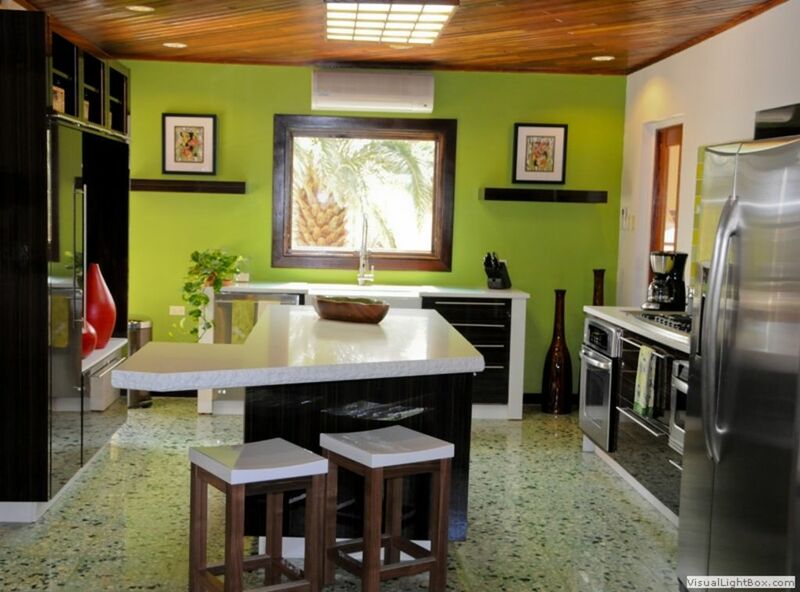 This luxurious, private oceanfront villa with 4 bedrooms & 4 bathrooms in the main house and 2 bedrooms, 2 bathrooms in the guest house, is situated at the northwestern tip of the island in Aruba's most upscale residential area, Malmok. Enjoy the sunset from the veranda or by the water's edge. Also enjoy swimming under the palm trees in a private child friendly pool surrounded by a garden oasis with waterfall and gazebo. Great snorkeling within walking distance at Malmok Beach, Boca Catalina and Arashi!! What an amazing stay we had at Aruba Villa 500! The layout was perfect. Plenty of space for everyone. Back yard was our own private Paradise! Love the surround sound music that could be played inside and out. Already tried booking again but it was full for when we wanted!! Loved the house and location! First, we loved our stay and didn’t want to leave! Second, the house is in a great location and in December the sun sets right across from the house. Malmok beach is small and private and 4 houses down to the right. The snorkeling is great there and cruise ships bring their people there to snorkel but they’re only there 30 mins in the morning and again in the afternoon. It didn’t interfere at all. The house worked perfectly for us and minor issues were handled immediately. Note that the cabana has 1.5 baths. Elianna, the housekeeper, was super and kept us organized. The kitchen could use sharper knives and more serving dishes but it was otherwise adequately supplied. We thoroughly enjoyed the pool, cabana, and deck. It felt like a mini resort. We will definitely rent this house again! We had a group of 9 people that recently stayed at Aruba Villa 500 and had a wonderful vacation! The house was perfect for our group. Plenty of space for each couple to have their own bedroom and bathroom. The kitchen was well stocked with everything we needed. The pool area was beautiful with options for those that wanted to be in the sun or the shade - and they have a great sound system for listening to your own music. The location of this house is great! We were able to walk up the beach to Arashi and down the beach to Eagle Beach. Good snorkeling within walking distance of the house! Watching the sun set from the upper deck was amazing! Anneke was an absolute pleasure to work with! She was very prompt answering all of our questions and made sure we had everything we needed prior to our arrival. She checked in with us during our stay to make sure there weren't any issues. The housekeeper came several times during the week - she did an awesome job and was also very nice to meet. I would highly recommend this house for your next vacation in Aruba. I would also highly recommend working with Anneke if you are looking for other options. She recommended this house for us and it was perfect! Our four generation family had a wonderful vacation in Aruba staying at this lovely property. We had 11 adults and a toddler and made many happy memories together. There were bedrooms and baths for, lots of space in the open living/kitchen area, a pool house with two bedrooms. The kitchen was well equipped and the living area had room for everyone. The pool area was beautifully landscaped and all enclosed which gave us lots of privacy and a place to play. We would recommend Aruba 500 for large groups. Aruba is beautiful! We hope to return. Aruba Villa 500 - Fantastic! Villa 500 is the perfect vacation home for your family or larger group. We had the pleasure of staying at the house from 30 Dec 2017 through 6 Jan 2018. Our family of nine (4 couples and 1 toddler) was able to relax and set up “base camp” for the week. The house has absolutely everything you could want or hope for. The home is spacious and well appointed. Large open family room, dining room and kitchen. The bedrooms and adjoining bathrooms provided the privacy you want. One of the couples stayed in the pool house and said they’d come back and rent just that. The outdoor space made it feel like you were staying at a resort. There is a beautiful pool, seating, veranda, and outdoor kitchen area. There is a front porch area to have morning coffee while looking across the street at the beach. Never mind the 2nd floor rooftop deck that was perfect for nightly sunsets over the water. Beach chairs and towels made it easy to load up the crew and head to the various beaches across the island. The house was so welcoming that you actually looked forward to coming home and kicking back and relaxing in the backyard. There was a daily cleaning service that did towels, helped with laundry and kept the house nice and tidy. Anneke was a wonderful home caretaker who was very helpful with any questions you had or suggestions for island activities. At to top it all off our daughter got engaged that week right across the street on the beach at sunset. We can’t say enough about the memorable vacation we had. First class service all the way from Anneke and her team. House was great, plenty of room for large families and groups. We had 7 adults and 5 kids from 2-11 in our group. Kitchen was fully stocked and we took advantage of eating in most mornings for breakfast and two nights for dinner. Pool area was roomy and private. Would highly recommend this property to anyone looking for a rental with lots of room and bedrooms.